There is a popular series of Vines (those six second videos that are easily shared and spread across social media platforms) in which a serious looking Ryan Gosling, most often in the throws of a passionate and emotional scene, is offered a spoonful of cereal, which, being that he is on the other side of the screen, he always refuses. The series of videos’ was created by Vine user Ryan McHenry in 2013. The Vines went “viral,” and were later compiled into YouTube videos, Buzzfeed Lists and were featured in countless entertainment outlets. In just a couple of months the video had upwards of 5 million views. Okay, so this is an interesting way that the third space, that as-if space fostered online by the affordances of the technological platform, enabled people from different social circles and environments to interact as though friends. Absolutely, that is an interesting thing about the Internet, but as it turns out, this is about more than that. Had this story been just about the interactions of a Twitter/Vine user and a celebrity it would be another interesting example, in a a long line of examples, of the way access to pop culture figures has shifted, and the way images, symbols, figures can be re-mediated, the stories can shift and be retold. And yes, that is compelling and interesting and the subject of much of what we blog about here. This extended beyond that. What was a seemingly trivial connection between Gosling and McHenry shifted as McHenry’s story shifted. The story turned tragic. McHenry began as an online persona, posting about celebrity news, creating and perpetuating memes, and inserting his own life into his tweets every now and again. Then, he transitioned from the fun guy we like to follow because of his quick wit and ability to use the platform in hilarious ways, to the guy we looked to for some kind of bigger meaning. Why? Because he got sick. McHenry was diagnosed with osteosarcoma, and after a two year fight, he succumbed to the disease. McHenry, through his offline experiences, became a source for inspiration online. While there is a great deal that can be problematized around the way illness shifts the locus of a person’s identity to outside audiences and cultivate them as an inspiring figure, this post is less about that. Rather, this post wants to interrogate how the digital platform fosters the perpetuation of this socially constructed myth around illness so fervently that even McHenry himself embodied the persona of a powerful, strong, sick person who would ultimately try to overcome his diagnosis. 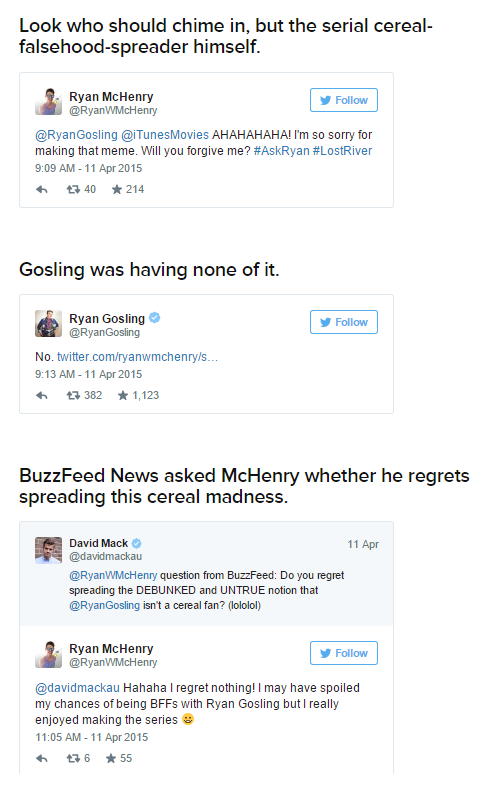 Despite embodying the persona of illness, McHenry did not abandon his passion for his Gosling meme. 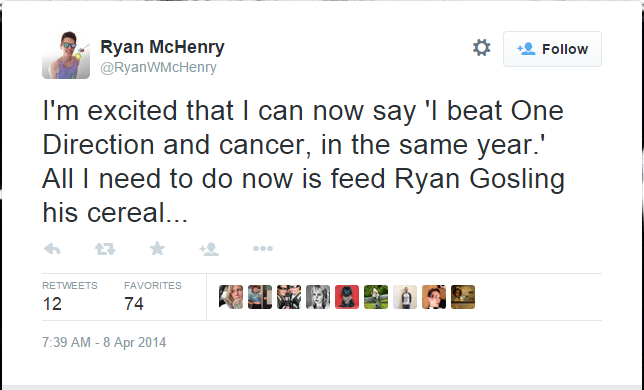 Even up to a few months before his death McHenry was posting Vines of Ryan Gosling. He had 31 parts in total to his series of Gosling memes. He also had countless tweets with the hashtag #f@ckcancer. He chronicled his journey from diagnosis to remission on Twitter and Vine, creating a chronological narrative of what illness, fighting, and then healing can do. His narrative is one that highlights the true depth and breadth of our social media curations. The items he posted, and the experiences he posted about gave a window into McHenry’s life, the way he wanted to tell the story, despite the constraints of the various platforms he used. Then, without notice, McHenry passed away from his disease at only 27 years old. Gosling, upon hearing the news, took what was a sarcastic relationship and made it a tender one by posting his own Vine, of himself, finally eating his cereal. Aside from being a particularly touching tribute, this message, this remediation of his own remediation by Gosling highlights the significance of meme culture. The meme, as a popular form, allows a simple and easy to follow template through which to articulate shared beliefs. This cultural form is one that is not relegated to one type of person or group but rather appears to be one that bridges multiple groups and cultures. The Gosling meme, while perhaps trivial in its nature, was funny across many cultural borders. The power of the meme lies in its ability to be replicated, imitated across users, which is what enabled Gosling to take a trivial meme of himself and make it a powerful tribute to a person who is no longer with us. Knoebel and Lankshear explain that memes haves explanatory power when it comes to cultural development, that a meme can pass “outside the shared affinity space within which it first came to prominence,” thus transmitting some kind of meaningful idea or pattern that contains cultural information. Seen this way, a meme, even a silly one of a serious looking celebrity denying cereal, has immense cultural power, enabling the maker of these memes to accrue cultural capital in ways that were perhaps more challenging before. So what can be made of McHenry’s online narrative as a whole? How can sense be made of the way the jovial gave way to mediations of the traumatic, grief, and mourning in the third space enabled by digital technology? McHenry likely did not intend for his Gosling meme to become a memorialization of his life, his sense of humor, and his digital footprint. That his meme did take on this life indicates the ability of the third space to truly translate into a sacred space. It seems, based on the way this meme shifted according to the way offline events shifted, that the space created through use of the digital can become what a user needs it to become. The space can become a space of mourning, a space of self-expression, a space of humor. The life that this narrative took on marks an important affordance of the digital. The ability for people to make and remake meanings as they suit their personal engagement with media is a powerful means for expression, identity negotiation and meaning construction. McHenry’s meme, and Gosling’s re-mediation of that meme came to the forefront of our collective digital imagination this week, they gained prominence, went viral, and they will soon fade from newsfeeds and pop culture lists. Their importance, however, is not found in their longevity; rather, it is found in the traces that they leave on our digital memory. Every viral moment fosters the next. Every meme that is made and remade becomes a powerful tool in the construction of meaning, these memes become quick vignettes of and windows into the larger cultural repository of ideas. I don’t know Ryan McHenry, and I don’t know RyanGosling, but I can confidently say that these memes fostered and then shifted a relationship between these two men from different contexts. I can also confidently say, as an audience member, the meaning that was produced was one that articulated joy, laughter, sadness, and reflection. Davies, Julia. “Online Connections, Collaborations, Chronicles and Crossings.” Play, creativity and digital cultures (2009): 108-24. Knobel, Michele, and Colin Lankshear. “Online Memes, Affinities, and Cultural Production.” A new literacies sampler (2007): 199-227. Walker, Rob. “When Funny Goes Viral.” New York Times Magazine 16 (2010).